Brookings economist Ted Gayer opines. Brad DeLong and Paul Krugman attack. In an odd twist of legislative history, the U.S. estate tax is scheduled to expire on January 1, but for one year only. This article describes people responding those peculiar incentives. Nothing's certain except death and taxes -- but a temporary lapse in the estate tax is causing a few wealthy Americans to try to bend those rules. Starting Jan. 1, the estate tax -- which can erase nearly half of a wealthy person's estate -- goes away for a year. For families facing end-of-life decisions in the immediate future, the change is making one of life's most trying episodes only more complex. "I have two clients on life support, and the families are struggling with whether to continue heroic measures for a few more days," says Joshua Rubenstein, a lawyer with Katten Muchin Rosenman LLP in New York. "Do they want to live for the rest of their lives having made serious medical decisions based on estate-tax law?" Currently, the tax applies to about 5,500 taxpayers a year. So, on average, at least 15 people die every day whose estates would benefit from the tax's lapse. The macabre situation stems from 2001, when Congress raised estate-tax exemptions, culminating with the tax's disappearance next year. However, due to budget constraints, lawmakers didn't make the change permanent. So the estate tax is due to come back to life in 2011 -- at a higher rate and lower exemption. To make it easier on their heirs, some clients are putting provisions into their health-care proxies allowing whoever makes end-of-life medical decisions to consider changes in estate-tax law. "We have done this at least a dozen times, and have gotten more calls recently," says Andrew Katzenstein, a lawyer with Proskauer Rose LLP in Los Angeles. The situation is causing at least one person to add the prospect of euthanasia to his estate-planning mix, according to Mr. Katzenstein of Proskauer Rose. An elderly, infirm client of his recently asked whether undergoing euthanasia next year in Holland, where it's legal, might allow his estate to dodge the tax. Sunday Jan 3 at 8 pm at the Atlanta Marriott Marquis [www.marriott.com] room A704. Free and open to the public! Stand-up economist Yoram Bauman [www.standupeconomist.com] ("What to Expect When You're Expecting the Nobel Prize"). Kenneth West of the University of Wisconsin will be presiding. The MIT economist is in favor of it. 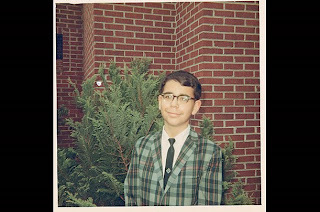 Click here to identify this future economic superstar. This chart, from Jim Hamilton, shows the ratio of a stock market price index to the average of the previous ten years of real earnings. The red line is the historical average. By this metric, popularized by Bob Shiller, the market is now slightly above its historical average valuation. In the period around March and April 1930, there were a few “green shoots” in the economy. The stock market recovered a significant chunk of the huge losses in 1929. (I recall the Dow fell well below 200 during the famous crash, and got back up over 260 in April. The 1929 peak had been 381.) Then in May and June everything seemed to fall apart, and stocks crashed again. So what happened in May and June? The headline news stories during those months were the progress of Smoot-Hawley through Congress. Each time it cleared a major legislative hurdle, the Dow fell sharply. This pattern was obvious to those following the markets, and was frequently commented upon. After it cleared Congress it went to Hoover. The President received a petition from over 1000 economists pleading with him to veto the bill. (A veto would not have been overridden.) Over the weekend Hoover decided to sign the bill, and on Monday the Dow suffered its biggest single day drop of the entire year. Scott then goes on to propose an explanation of these events that can be viewed as consistent with the textbook Keynesian model. In particular, I interpret Scott as saying that the retreat from free trade reduced business confidence, shifted the investment function I(r) to the left, and thereby reduced aggregate demand. One general lesson from his discussion is that it is often hard to distinguish shocks to aggregate supply and shocks to aggregate demand. Policies and events that adversely affect aggregate supply (e.g., trade restrictions) will often reduce the marginal productivity of capital, decrease investment spending for given interest rates, and depress aggregate demand as well. In the short run, the indirect demand-side effects of "supply shocks" could potentially be larger than the direct supply-side effects. This is something to keep in mind as our economy enjoys the beginnings of a recovery. The economics editor for the Sydney Morning Herald summarizes the Ten Principles of Economics from Chapter 1 of my favorite textbook. From the ever sensible David Wessel. The latest from my friend and former student Alan Viard. Up 1.8 percent this year. At this point, there is a near mathematical certainty that the scheme of health insurance market regulation contemplated by the Reid bill will reduce the risk-adjusted rate of return below the level needed to keep these firms in the individual and small-group health-insurance markets. I am not aware of a single provision in the Reid Bill that looks to ensuring a minimum rate of return. And there are countless provisions in the bill that impose new obligations to cover services while eliminating the revenue sources to deal with them. It is just this combination of regulatory programs that leads the CBO to treat private health insurance issuers as part of a federal program—as though they have been subject to de facto nationalization. Looking for a Christmas gift for that special econonerd in your life? Try Steven Landsburg's new book, The Big Questions. I recently finished it, and it is much fun. Reading it is like having dinner and sharing a bottle of claret with a smart, creative, iconoclastic friend. The conversation jumps from topic to topic in math, physics, philosophy, economics, public policy, etc., in a seemingly random fashion, and your friend does not always convince you of his point of view. But throughout you are entertained, and in the end you are even edified. The policy debate about drug reimportation brings up a lot of interesting questions, touching on the topics of free trade, price discrimination, and protection of intellectual property rights. Princeton economist Uwe Reinhardt has a good discussion of some of the issues. For an old post of mine, click here. We reached different conclusions about a new educational technology. I am not at all confident that I am right about this one. 1. 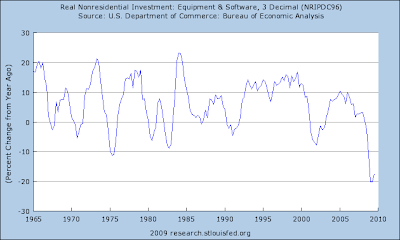 Above is a chart of the growth rate, from four quarters earlier, of real investment in equipment and software. Notice the left scale. Investment spending is very volatile. This is one of the standard stylized facts about the business cycle. 2. Investment has been particularly weak during this economic downturn. Weak residential investment is not a surprise, as the downturn was started by events in the housing market. But as this graph shows, business investment has also been very weak. 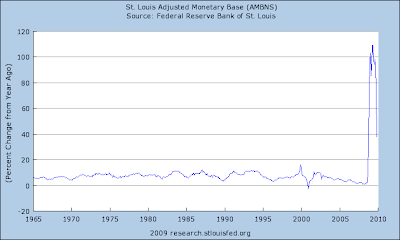 Indeed, by the metric used in this graph, it is far weaker than in previous deep recessions, such as 1982. 3. Why is business investment so weak? Part of the reason is that the downturn is severe and investment responds to the overall economy. Part of the reason is that the credit crunch makes financing more difficult. Part of the reason is that the policy environment seems adverse to business. I am referring here to a group of policies that include higher minimum wages, the seeming retreat from free trade, proposed mandates to provide employees health insurance, higher prospective energy costs from climate change regulation, and the likelihood of higher future tax rates resulting from the huge fiscal imbalance we are now experiencing. All of these factors have worked in concert to depress business investment. 4. 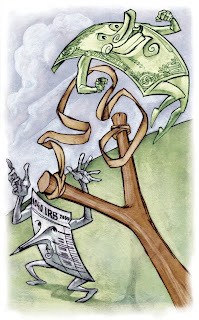 The recent weakness of business investment was one of unstated reasons why, in my recent NY Times column, I suggested that an investment tax credit (ITC) might have been a better form of fiscal stimulus than what we in fact are getting. Given the amount of money being spent on stimulus, the ITC could have been sizable. The measure of investment used in the chart above is about $1 trillion per year. So, to give a very rough example, if Congress had passed a 20 percent ITC in 2009, 10 percent in 2010, it would have cost the Treasury about $300 billion. Essentially, the Treasury would have picked up 20 percent of the cost of all of these investments if done this past year, and half that amount next year. 5. Some readers might wonder if this policy would work in the presence of the zero lower bound on interest rates (aka the "liquidity trap"). The truth is that we don't fully understand the role of the zero lower bound, and most of what we do know is based on stylized theoretical models with scant evidence to back them up. But those models suggest that an ITC would work just fine. The zero-lower-bound whiz kid Gauti Eggertsson in fact endorses the ITC as a plausible policy in that environment. 6. In my most controversial NY Times column, I said that what the economy needed was negative real interest rates, which could be accomplished via inflation. A temporary ITC does something similar. By temporarily reducing the effective price of capital goods, it creates expected inflation in this particular price. Under the numerical example above, the effective price of new capital would immediately fall by 20 percent, and expected inflation would rise by 10 percent. If nominal rates stay at zero, the real interest rate measured in units of new capital goods would become negative 10 percent. That is one way to view the way in which a temporary ITC stimulates investment spending. 7. So much for theory, but would it work? The cash-for-clunkers program is thought by many to have promoted, or at least accelerated, car purchases. An ITC would be similar, but it would apply to business investment rather than personal cars. Instead of targeting a very narrow, politically favored industry, it encourages investment broadly. It should have positive effects on aggregate demand in the short run and positive effects on aggregate supply in the medium and longer run. 8. Recall that an investment tax credit was part of the Kennedy plan to get the economy going again back in the early 1960s. According to historical reports, Kennedy came to this idea of tax cuts with the advice of economist Paul Samuelson, who just passed away. 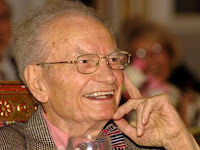 In memory of Professor Samuelson, if the Obama administration wants to switch gears and try a sizable investment tax credit, I propose that we call it the Paul Samuelson Memorial ITC. 9. Update: Intrigued by this idea? Try these further readings on the subject by Bruce Bartlett and Hal Varian. Like many students of my generation, I started my studies of economics with Paul Samuelson. When I took econ 101 as a freshman at Princeton, Paul's textbook, then in its 9th or 10th edition, was the assigned reading. I recall the book well, and I give it a lot of credit for fostering my interest in economics. A few years later, as a grad student at MIT, I sat in some of Paul's lectures. They were mainly about "reswitching" and the Cambridge-Cambridge capital controversy. A few years after that, when I was an assistant professor, Paul was part of the effort that tried to recruit me to join the MIT faculty. (In the end, I decided to stay at Harvard--persuaded in large measure by Paul's nephew, Larry Summers). Over the past decade or so, I saw Paul off and on, mainly at the Federal Reserve Bank of Boston, where we both served on an academic advisory panel. He remained engaged and insightful well into his years of retirement. He will be missed, in that meeting and many other places as well. Prakash Loungani profiles the Nobelist. Click here to watch Joe's recent congressional testimony. The noted housing economist and textbook author is stepping down. Thanks to the RTE blog for the pointer. Chapter 21 of my favorite textbook discusses the role of income and substitution effects in determining labor supply, including a case study about lottery winners. UCLA economist Matthew Kahn applies this kind of thinking to the Tiger Woods saga. Before reading Matthew's analysis, ask yourself this question: Does economic theory predict that Woods will play more or fewer tournaments next year? 1. Either a carbon tax or a cap-and-trade program will result in substantially lower economic costs than command-and-control regulations that mandate technologies, fuels, or energy efficiency standards. 2. Given the uncertainty of the future costs of climate policy, a carbon tax is more economically efficient than cap-and-trade. 3. Carbon allowances in a cap-and-trade program would be susceptible to price volatility. Price volatility causes economic disruptions and complicates investment decisions. It also could lead to political pressure on Congress to repeal or substantially loosen the cap. 4. A carbon tax, in which the revenues are used to offset economically harmful taxes or to pay down our deficit, would substantially lower the cost of climate policy compared to a cap-and-trade program that gives away allowances for free. 5. The currently proposed climate bills rely heavily on offsets to reduce the overall costs of cap-and-trade. Given the substantial potential value of offsets, there is a very real concern that offset integrity will not be maintained. This would result in a weakening of the cap, undermining its environmental benefits. I am bit embarrassed to admit this, but the answer is Lady Gaga. Her music reminds me Blondie, which I enjoyed back in my student days. I particularly like the Lady Gaga song Bad Romance. Update: If you wonder about my comparison, listen to Gaga's Summerboy and Blondie's Heart of Glass. Apparently, the argument runs, there are hidden synergies that make expertise in examining banks and writing consumer protection regulations useful in setting monetary policy. In fact, collecting diverse responsibilities in one institution fundamentally violates the principle of comparative advantage, akin to asking a plumber to check the wiring in your basement. The biggest threat to the Fed's independence is doubt about its competence. The more the Congress expects the Fed to do, the more likely will such doubts blemish its reputation. My Harvard colleague Ed Glaeser looks at the way forward. A friend of yours is considering two providers of cell phone services. Provider A charges $120 per month for the service regardless of the number of phone calls made. Provider B does not have a fixed service fee but instead charges $1 per minute for calls. Your friend’s monthly demand for minutes of calling is given by the equation Qd= 150 – 50 P, where P is the price of a minute. a. With each provider, what is the cost to your friend of an extra minute on the phone? b. In light of your answer to (a), how many minutes would your friend spend on the phone with each provider? c. How much would he end up paying each provider every month? e. Which provider would you recommend that your friend choose? Why? If you enjoy this kind of thing, click here for the previous installment in this series. As always, I will not post the answer, so instructors can use the problem as homework. In a new NBER working paper, Daniel Hamermesh and Gerard Pfann estimate the probability that an economist will be honored by his peers (by receiving a Nobel Prize, being elected President of the American Economic Association, being named a Distinguished Fellow of the AEA, or winning the AEA's Clark Medal). The bottom line: An economist's citation ranking is a strong predictor. Given citations, an economist's number of publications has no additional predictive value for whether he will obtain such an honor. FYI, here is an up-to-date citation ranking of more than 20,000 economists.